Maximinus Thrax, the Thracian, originally named Gaius Julius Verus Maximinus, was born circa 173 CE in Thrace and died in 238 CE, near Aquileia. He was the first soldier to rise through the ranks to become Roman emperor although his reign only lasted 3 years (235–238 CE). He was a Thracian tribesman “of frightening appearance and colossal size”. There were many feats of the strongman told about him and it was these strongman feats that brought him to the attention of emperor Severus. Maximinus was enlisted into the imperial bodyguard where he had a distinguished military career eventually achieving a senior command in the Roman invasion of Persia in 232 CE. Later he became emperor in a military coup. He was eventually ousted in a civil war pushed by the Senate against him. I have been very much looking forward to my review copy of this arriving which, after a couple of redirects, finally found its way to me in the Philippines. I have been looking forward to this for a couple of reasons. One is that my knowledge of Rome is mostly based in the times of Augustus and earlier and second, I have been reading a fair bit of historical fiction of late set in the period of Rome in the second and third centuries CE. Harry Sidebottom’s series, Throne of the Caesars, is set in the reigns of Alexander Severus and Maximinus Thrax. 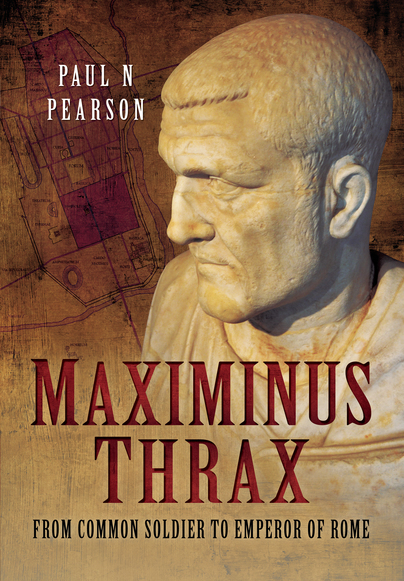 Pearson’s work is a narrative history of the life and times of Maximinus Thrax up to and past his assassination. It reads like a thriller, equipped as it is with various accounts of the treachery and assassination that were central to Roman politics. Pearson covers the subject well, so well and in such an interesting manner that I am now looking for further reading concerning those times. The book itself is a great read and only real world time constraints (my day job) forced me to put it down at night. My biggest surprise concerning Maximinus is that he has not been the subject of a movie yet. I can thoroughly recommend this book to anyone who has in interest in these times. I can also thoroughly recommend it to those who you who don’t as I am sure after reading this volume you will be searching for more information about this interesting period.